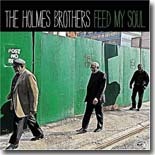 The Holmes Brothers has always been a Blues Bytes reviewer favorite. Their newest CD, Free My Soul, is one of their best yet, making it an easy choice to be our Pick Hit for the month. Our publisher is already proclaiming The Mannish Boys' new CD, Shake For Me, as his pick for best album of 2010. It's this month's Surprise feature page. This month's Flashback steps back and looks at vintage classics from both Buddy Guy and Junior Wells. Our What's New section features new releases from Guitar Shorty, Nick Moss, Cash Box Kings, Kirk Fletcher, Terry "Big T" Williams, Mickey Thomas, Coco Montoya, Downchild, Alastair Greene Band, Phil Berkowitz, and much, much more. This may just be our largest issue ever, so strap yourself in and enjoy!